Peter is the 14th generation of Kleins working as a winemaker so he really know his stuff. His fantastically fresh Pinot Gris is packed full of ripe pear and honeydew melon fruit with a spritz of zippy lemon on the finish. Rich, textured and powerful - it's classic Pinot Gris and it's absolutely delicious. This lively, dry white is an excellent pairing for grilled salmon or an earthy mushroom risotto. Peter Klein is one lucky guy - he's young, talented, and on the road to great things. But most importantly of all, he has YOUR funding - and without that, this ravishingly ripe and refreshing Riesling couldn't exist. A crisp and lively flavour explosion, with juicy lemon, luscious lime and white peach positively bounding out of each glass. Top that off with a heavenly hint of fragrant honeysuckle, and you've got a wine worthy of even the fanciest al fresco feast. 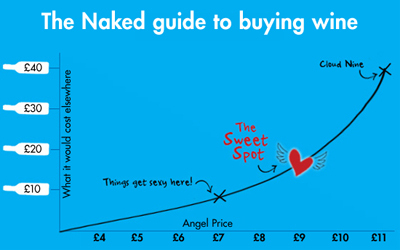 Wines of this quality don't come cheap - unless you're an Angel, of course! Riesling and spicy food are best friends forever, but if you're not a fan of the fire... grab yourself a bottle and try it with some marinated chicken and minty yoghurt dip for a bit of mid-week decadence.